Here is a one of my students writing about his experience back in Conamara and speaking the irish language. “One of the most pivotal moments in learning Irish was my first conversation in Connemara with a native speaker. Paraic had been encouraging me to pick up the courage and just start with, “Cé chaoi a bhfuil tú?” and see what happens next. The moment came when I was helping the manager of the Connemara Hostel in Leenaun. When I was done helping him he pointed out that I had left my cell phone charger on a table. I forced myself to say, “Go raibh maith agat” in a shaking voice. He instantly replied with a mix of surprise and appreciation, “Tá failte romhat!” Later that night I walked up, stuck out my hand and said to him, “Cé chaoi a bhfuil tú?” and we were off and running. Paraic wasn’t there to back me. I switched to English when I didn’t know the word, and just spoke as much Irish as I could. But something switched on in my head that wouldn’t have if I hadn’t jumped into the conversation, I started thinking in Irish for the first time and I had to do it quickly. I realized I just needed to relax and enjoy the experience of finally fulfilling a life long wish to speak with someone in the Gaeltacht and make myself understood. Mo Sheanathair ag caint Ar radió na gaeltachta í 1982. Tosaíonn an comhra thart Ar fiche nóiméad. My grandfather speaking on RNG in 1982. The interview starts around 20 minutes. 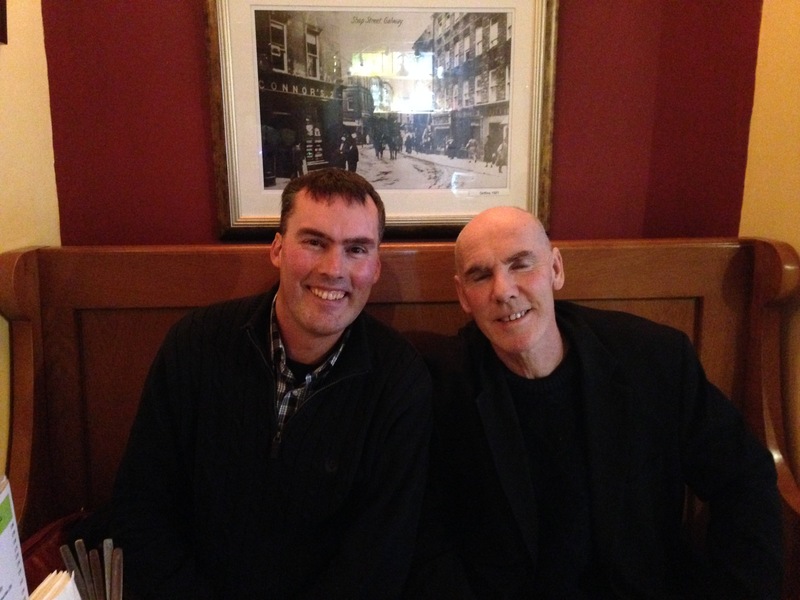 It was my pleasure to sit down with Micheal Mccaughan author of “Coming Home: One Man’s Return to the Irish Language” and talk to him about the Irish language and his book over a cupán tae. I recommend his book to anyone learning the Irish language. Labhair sé go paiseanta sa leabhar sin agus tá léargas mór aige ar stair na Gaeilge. Bhi an comhrá an-suimiúil idir an bheirt againn. Go raibh maith agat a Mhichael le haghaidh an comhrá breá. This summer I was teaching Irish at Gaeltacht Canada. Paraic Donoghue is a webpage that is growing day by day. My main focus is to deliver quality content to my Students that can help them towards learning the Irish Language. Advertisement opportunities are wide and many! Advertising on my website means lots of exposure to your product,website or blog! Please contact me for Rates. Hello everyone! This post is a way for me to update you on what I’m working on right now so that you can get a sense of what exciting things are coming up on my Website and Facebook page . The main project I’m focusing my energy on is my Skype lessons for Irish language learners, the website is a great way to introduce myself to everyone. I’m also on Facebook more. I am writing more on Facebook platform than my blog. Make sure to friend me on Facebook. Please email me if you’re interested in working with me on anything Irish language-related.